On a late autumn Solent shore in 2017 Elysia viridis (Montagu, 1804) has proliferated and peppers the shore. 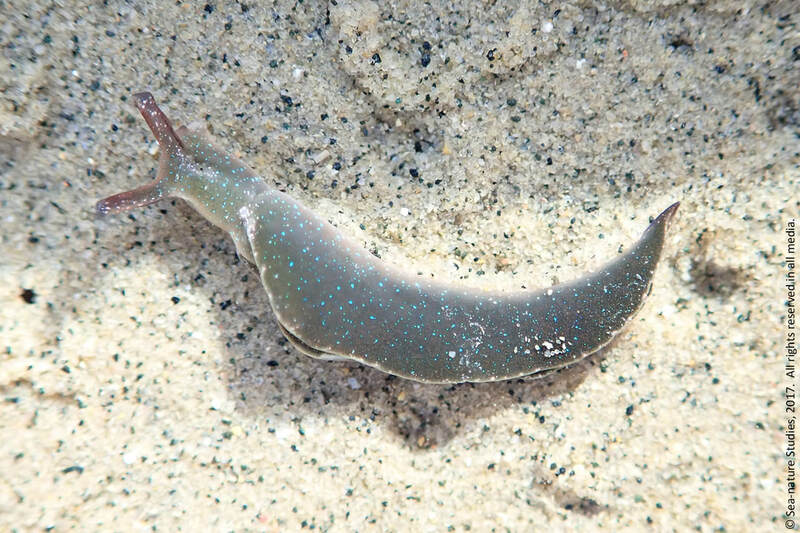 Commonly known as the solar-powered sea slug this small species sits within the Class Gastropoda and the Order Sacoglossa (referred to by some as the 'sap-sucking sea slugs'). They can grow up to 45mm in length. If you look closely you'll see that these small animals have a constellation of tiny electric-blue flecks across their parapodial wings and body. You'd need a hand-lense to see these spots in the field or, failing that, a camera with a good macro facility so you can zoom right in. Here, the rhinophores at the front blush a subtle apple-red but it's worth knowing that body colour can vary with diet. The spots are more constant but, not always blue. Like many molluscs they can be found on a variety of plants including Cladophora, Bryopsis, Codium, Ulva and Zostera. With the exception of Codium all these genera were available on the Solent shore where the image was taken. The literature suggests that they are specialist grazers focusing on one food source. If needed some can 'learn' to eat alternatives. Radular teeth are sculpted to suit particular food sources and switching from one to another results in a physical change in the size and shape of these teeth. These remarkable slugs are also accomplished thieves and it's the cells they steal which give them their solar-powered source of energy. Elysia viridis are kleptoplasts taking chloroplasts from the algae they graze on and incorporating them into their own digestive glands cells. Once here the chloroplasts can continue to photosynthesize for months enabling the slugs to exploit contributions from both heterotrophy and phototrophy to support their fitness. Interestingly, Elysia rufescens has been shown to accumulate a compound known as kahalalide F produced by the alga it feeds on, Bryopsis sp. Kahalalide F is an effective chemical defense against fish predation for both plant and slug. Jensen, K.R. (1989). Learning as a factor in diet selection by Elysia viridis (Montagu) (Opisthobranchia). Journal of Molluscan Studies, 55, 79-88. Thompson, T.E. (1976). Biology of Opisthobranch Molluscs, Vol 1. Ray Society: London. Thompson, T.E. & Brown, G.H. (1976). British Opisthobranch Molluscs. Linnean Society, Synopses of the British Fauna (New Series) No.8. 203pp.